In fall 2012, Prof. Amy Wolaver (Economics) consulted with GIS Specialist Janine Glathar on developing a web-based atlas on healthcare economics in PA. Wolaver received Mellon GIS funding to purchase inpatient hospitalization data from the PA Health Care Cost Containment Council (PHC4). In 2012-13, Wolaver and Glathar worked with a library-funded GIS student assistant, Darin Rockwell (Geology ’13) to begin mapping & analyzing the data. In summer 2013, Wolaver received Mellon funding to develop a prototype atlas that would also serve as a learning module for the 1st year students in the Society & Technology Residential College. Publication & Presentation – work with GIS Specialist to publish map services and create the web maps and data dictionary needed for RESC098 assignment. RESC098 materials were shared in a Map Gallery and accessible via a public-facing website. The maps in this gallery were created for use in an in-class assignment for Bucknell’s Fall 2013 RESC098 class, ‘The Future is Now.’ The class is a foundation seminar for first-year students living in Bucknell’s Society & Technology Residential College and explores how technology affects our everyday lives. 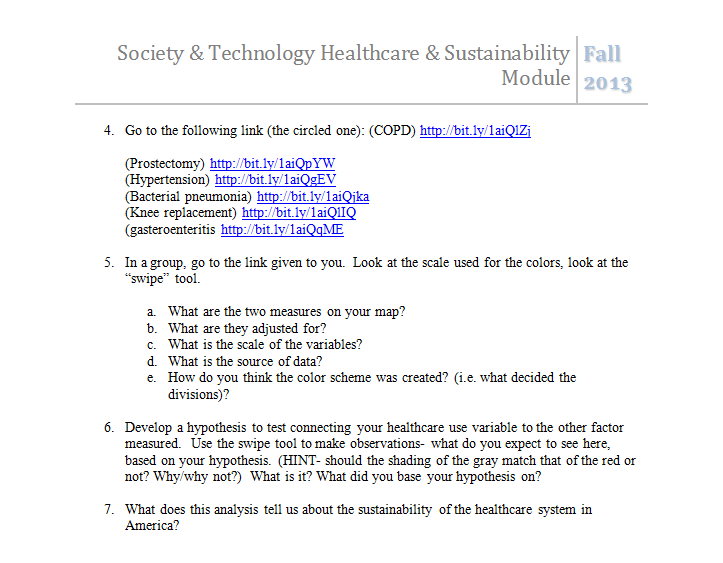 Prior to the assignment, Prof. Wolaver delivered a lecture to the class with background and context info students would need to have to connect the data in the maps to their readings from a class text, “Tracking Medicine: A Researcher’s Quest to Understand Healthcare,” by Dr. John Wennberg. 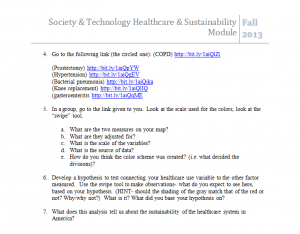 The assignment was designed to prompt students to think critically about the decisions (made by their peers who worked on the summer research project) that went into crafting the variables shown in their map – and to think spatially about the dynamics of health care provision in Pennsylvania and how this might relate to sustainability of the healthcare system.